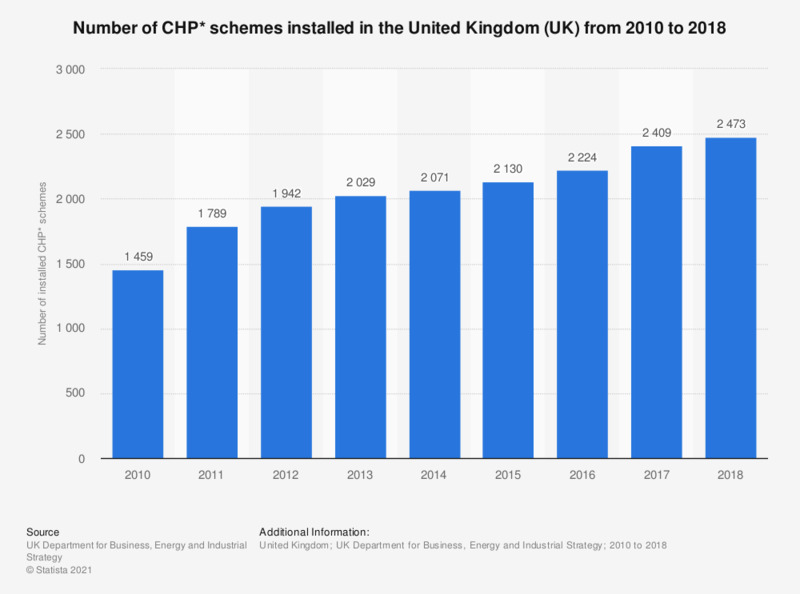 This statistic displays the number of installed Combined Heat and Power (CHP) schemes in the United Kingdom (UK) from 2010 to 2017. It shows that the total number of installation schemes increased significantly over this period, from 1,459 installation schemes in 2010 to 2,386 installation schemes in 2017. The source notes that a site may contain more than one CHP scheme; the capacity categories have changed since publication in the 2013 Digest. Additionally, MicroCHP schemes installed under FIT are not included in these figures. At the end of 2015, 498 such schemes were registered on Ofgems Central FIT Register totalling 0.51MWe.